"I'm dreaming of a white Christmas," The continued sentiment of generations of Christmas enthusiasts, both before and after Bing Crosby sang those lyrics in the immortal Christmas tune White Christmas. While most Christmas enthusiasts continue to long for a white Christmas, there's another Yuletide shade that's become increasingly important to people worldwide: green. 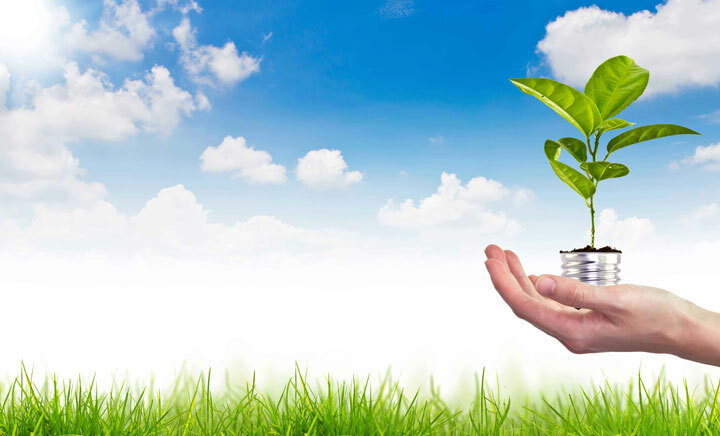 Environmental consciousness is becoming top-of-mind to people around the globe. More people than ever before are acknowledging that this planet is the only place we have to live, and it's in our best interest to care for it. This new shift in environmental awareness has thus affected what we eat, what we drive, and overall, what products we buy.. With this new desire to go green, it has also impacted the ways in which we choose to celebrate our favorite holiday; Christmas. As the new Christmas Season rapidly approaches, be sure to add a little green to your Christmas cheer! Want to know just some of of the ways that Christmas Designers is working to help you enjoy a green Christmas? There are many benefits that LED technology provides to consumers, but in green terms, perhaps the most important is energy-efficiency. Less Energy: LED products, on average, use up to 90% less energy than traditional lighting products. Ninety percent! That's going green in a big way. LED’s are energy efficient: Using LEDs vs. Traditional incandescent lighting can save you some green each time you pay your energy bill during the holiday season. Longer lasting: LED products that we carry last a lot longer than traditional incandescent lighting. An LED bulb, in fact, can offer a service life of up to 75,000 hours. So each LED bulb that you purchase can potentially replace dozens of traditional bulbs that you otherwise would have used during that life of that single LED bulb. That means that each LED bulb that you purchase also eliminates the environmental cost of manufacturing all of those traditional bulbs - a huge positive impact to the environment! Energy-Efficient Shipping: We've made remarkable strides in reducing the amount of energy it takes to get your products to you. Because of the techniques we've developed and the materials we use in packaging our products, we've been able to dramatically reduce the amount of energy consumed with each shipment. Thanks to our eco-friendly packaging, our light sets, for example, take up 60% less space than the average light set sold through retail outlets. That helps to tremendously reduce the amount of energy required to ship the products. Eco-Friendly Packaging Material: In the past, cardboard has been the traditional packaging material for most of the products sold at Christmas Designers. But we've been working hard to get away from cardboard, because it has a huge negative impact upon the environment. It's environmentally expensive to produce, ship and dispose of instead of cardboard, we pack all of our light sets in poly bags using only recycled poly bags. As a result, we use 75% less material in packaging our products than if we were using cardboard, providing a big bump in making our products more eco-friendly. Eco Friendly Factories: We have to juggle lots of variables in choosing the factories that manufacture our products: quality, price, service, just being some of the factors taken into consideration. With a lot of research and a great team working for us, we've added one more variable that must be considered when we're choosing a manufacturer: eco friendliness. So the plastic bottles that you so conscientiously turn in for recycling just might come back to you in your next purchase from Christmas Designers. And that's a good thing! Eco-consciousness is a good thing. The more that people are concerned about the health of our planet, the better off all of us will be. But admittedly, there can be a downside to eco-consciousness. That can happen when the products you desire clash with your good intentions to go green. You can be torn between fulfilling your desires, and staying true to your eco-friendly beliefs. That's why we wanted to tell you that your favorite source for Christmas lighting and décor shares your concerns about the environment. So when you're browsing through our online products or catalog while planning your Christmas, there's no need for your eco-consciousness to be pricked. At Christmas Designers we're doing everything we can to assure that our products and packaging are as eco-friendly as possible.